Sunrise Villa is a private beachfront villa rental that offers 5 acres of 400 feet of beachfront in the exclusive gated neighborhood of Orchid Bay Estates, Cabrera, Dominican Republic. Sunrise Villa has over 11,000 sq ft featuring 8 bedroom ensuites, a large living room with dining area, and an expansive exterior with a large private pool and hot tub. Sunrise Villa is a single villa comprised of a collection of buildings, 5 of which contain a total of 8 bedroom ensuites. The buildings are located throughout the property, steps away from the Main House facilities. Each is surrounded by botanical gardens which inspires a soothing and relaxing ambiance. The suites have all the comforts that you would expect. Upon entering the villa Main House, you’ll discover the Grand Entrance Hall and breathtaking living room and game room areas, chef’s kitchen, and Manana Bar. The views of the blue sparkling water will confirm that you have found paradise! Modeled after the elegance and privacy of a modern Bali village, Sunrise Villa infuses romance into the life of your romantic beach vacation. 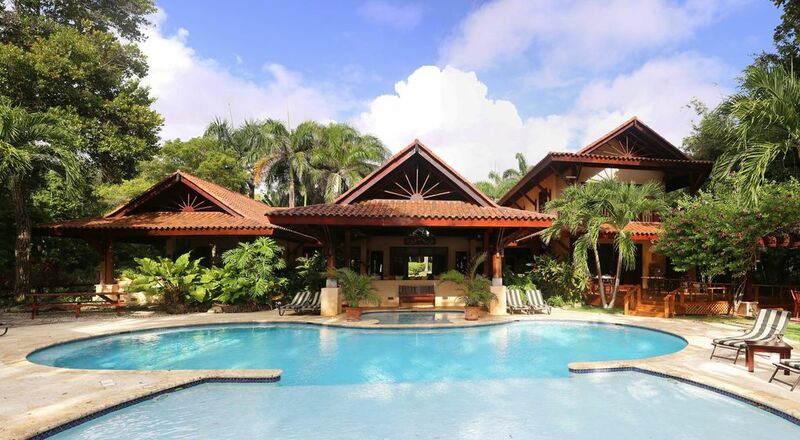 Our prestigious luxury Dominican Republic villa rental was designed and built between 2001-02. It has become the ideal destination villa for a luxury vacation getaway suitable for family reunions, birthday celebrations, island beach weddings, Caribbean golf destinations as well as romantic weekend escapes. We cater to families and even have organized activities for kids, teens, and young adults lead by a Youth Host. With more than ten years of Dominican Republic vacation rental experience, we believe our guests will walk away with vacation memories to last a lifetime. Want to be adventurous and tour the island but have no idea where to go? Our fully staffed villa includes concierge, a bartender, masseuse, maids, and more to meet all of your needs. Once you have settled in, enjoy the pool and hot tub, take a nap in the hammock, go for a walk on the beach, or bathe in the sun at the pool! We invite you to explore our website and experience the wonders of the Dominican Republic and the luxury Caribbean vacation villa that awaits you. See for yourself why over 5,000 guests over the past several years have come to love and enjoy Sunrise Villa. Please view our virtual tour which provides you with accurate information and real non-filtered views of Sunrise Villa. While taking the tour, imagine yourself in the grand entrance hall, sitting in the hot tub with friends, dining outside, and having a massage to relax. This can all be yours, call us today! 1-866-99-VILLA. Our website is very complete, great photos, videos, and much more information. Sunrise Villa is the ultimate spot for a private Dominican Republic villa rental vacation of a lifetime! > Named after the outstanding local lager! *All bedrooms feature safes for locking valuables, roomy closets, and executive refrigerators. The Royal Palm, Samana, Presidente, Garden and Diamante suites also offer hair dryers and a special make-up area with mirrors in the baths. Need space for friends and family? We're the Potters, from Northern Virginia. We didn't buy Sunrise Villa, we designed and built it. We're both semi-retired, and actively involved in the running of the property and it is our favorite little corner of paradise. KP does the managment and marketing side, JP does the creative. you'll see her work throughout the villa. Our 3 sons absolutely love Sunrise Villa. Our extended family have all enjoyed time there as well. We love luxury travel but prefer luxury that is laid back, understated, and relaxing. Sunrise fits that philosophy to a tee. We love the Dominican Republic. The island is lush and beautiful. The ocean is stunning. We love the food, the cigars, and the rum. The real secret is the Dominicans themselves. They are the nicest folks in the Caribbean. We are located directly on the Orchid Bay beach. Note this is the South beach, the larger of the two. :Laundress to do it for you! Third Time and Still a Charm! Just returned from my third trip to Sunrise Villa, and it was as amazing as ever. Great food, accommodations, and people. Of course, massages and pedicures were part of the trip. Loved the half day outing to various local attractions, and the lunch at Playa Preciosa. How do I spell relaxation? Sunrise Villa. This trip could not have been any better. I've traveled all over the world during my 20+ year military career and Sunrise Villa ranks at the top of my most enjoyable experiences. First of all, the Dominican Republic is a gorgeous and friendly country. The people are kind and eager to assist at all times. Kevin Potter has created a paradise in the midst of an already beautiful setting. Sunrise Villa is perfectly positioned to capture the true beauty of the island while offering all the amenities you would expect from a top tier resort. It has the feel of home, perfect for both a family with kids or adult getaway. The staff of Sunrise Villa go out of their way to make your stay perfect. Taking a page out of the playbook of Mr. Walt Disney, they are never in the way but always there when you need them. Sunrise Villa offers connections to many other getaway options. I took advantage of a three hour four-wheeler tour into the mountains offered from Everything Under the Sun Tours. Chris and team have a variety of options for all tastes and adventure levels. Our escorted excursions into the town and local beaches gave us even more flavor of the culture of the city, something I cherish as a person who loves to see humanity. I cannot end this without talking about the food. If you like fresh seafood every day, well prepare to be in Heaven. Many mornings I sat in perfect solitude enjoying the view of the namesake enjoying my cup of joe while watching tiny fishing vessels, often 1-2 manned, heading out to fish. When they returned with their catch that afternoon, Sunrise Villa chef (Frank) would select the evenings meal plan. Fresh Mahi-Mahi and some of the biggest Red Snapper I have ever seen were a daily addition to the menu. Juices squeezed from fresh fruits, the purest and tastiest meats and cheeses, you name it. It was just awesome. All in all, it was an amazing trip and I can't wait to return! Near Southeast Community Partners is a Washington DC based organization that supports schools and the environment. We decided to hold a retreat at the villa to plan for future growth, team building and more. It was the best decision that we could have made. As a result of the surroundings, we accomplished everything the we set out to do. We have a plan for the future, a new outlook on our mission and are excited for what we can accomplish going forward. We arrived at the villa to a staff waiting to greet us with open arms, ushered us to the Mañana bar for a welcome drink and we had a wonderful dinner overlooking the pool and beach. Each meal was exceptional. We combined work with fun and relaxation. All of our meetings ran over and we found that no one was looking at their watches. Some of our directors went on a scuba diving trip and we all explored the wonders of Cabrera and surrounding area lead by the staff at the villa. If your organization is looking to hold a retreat, why sit in a conference room with a view of 4 walls when you can look at the pool and the ocean? Why not stay in a place that is exclusive to your group? The only downside to going to the villa is leaving when the trip is over. The property, staff and surroundings are amazing and our group is already planning a return trip. Thank you for an experience we will never forget. The wonderful setting, the great and attentive staff, everything was perfect. I especially liked having separate buildings or floors for each couple. That allowed for the ultimate in privacy. The food was simple, but very healthy and delicious. Each breakfast, lunch, and dinner were different, no duplications. The spa and pool were always the perfect temperature too. I was also surprised at the daily laundry service. Next time, I can limit my packing to just a few things. I totally would recommend this place to family and friends. Great food, staff,and accommodations. Very fun off site beach excursions. Highly recommended, this is the place you need to go. This was our 2nd visit to Sunrise Villa and AGAIN this place exceeded all expectations. Absolutely fantastic!! The staff is simply amazing greeting us as we arrived and actually knowing our names from our visit last year. That is very special. When choosing a destination, I'm the type of person who does MAJOR research before deciding and this place tops all by far. You will not be disappointed. The accommodations are very clean and beautiful...the grounds are spectacular. The food and drink is top notch!...quality, fresh and delicious!! Manana Bar rocks!...Ramon is the best bartender in the world. There is much to see and do outside the villa and the staff will arrange anything and everything...local restaurants, beautiful local beaches, lagoons, horseback riding on the beach, fishing...you name it. You just give the staff your need and they set it all up...you just enjoy!! This place is a must...look no further. Another awesome vacation...thank you Kevin and Jeanne (sunrise villa owners) and many thanks to the villa staff.